Mensusa https://www.mensusa.com/articles/the-outstanding-peak-lapel-suits.html The Outstanding Peak Lapel Suits The uniqueness of a suit depends entirely on the details like the lapels, collars, etc. The peak lapel suits are absolutely outstanding. It is really not known for certain when the suits were created. Men have been wearing suits from a very long time. Only the cuts and features have changed from time to time. The uniqueness of a suit depends entirely on the details like the lapels, collars, etc. The peak lapel suits are absolutely outstanding. Since men have become more fashion conscious from before, designers are working hard to offer them new designs in every suit style that they bring into the market. The ever-growing changes in the designs of the lapels that include the narrow and broad notch lapels, narrow peak lapels and wide peak lapels as well as the regular notch and peak lapel suits on the various types of cuts like the single-breasted and the double-breasted suits or simply the jackets, men find it really difficult to choose the ones that really enhance their personality and their structure. It is a rule that you must wear those outfits that make you look smarter and better and not the ones that you like. Your perfect choice of attire helps to improve your total appearance and cover up the flaws. So selecting the perfect suits with the appropriate lapels is very important. However, the peak lapel suits are versatile in this respect. 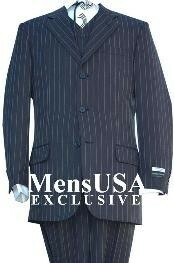 The cuts and features of the lapels suits all body types. It depends on the type of suit that you need to put on like the slim-fits or the double-breasted according to your structure. The work of the peak lapels is to create an outstanding and distinct style for you and make you stand out from the crowd. Lapels are actually the piece of cloth that is folded in front of the suit coat or jacket mostly in formal suits. The main feature of the peak lapel suits is the lapel edges that point up towards the shoulders. This specific cut gives the peak lapel suits a more dignified and a sober look just appropriate for formal occasions. However, the attraction of these lapels crossed the double-breasted coats and jackets and were used on single breasted suits too accompanied by the vest. This combination gave the peaked lapel suits especially the single-breasted ones a trendier look and thus gained more popularity among fashion conscious men. The fact is that only expert professionals can create the peaked lapels on single-breasted suits. Suits that are especially worn for dinner parties are often adorned with the peak lapels. The peak lapel suits can easily help you to create your own style statement to look outstanding at all gatherings. The combination peak lapel suits are really extremely trendy and give the wearer an alluring look to become the center of attraction at the parties. However, you can always dress up the peak lapel suits but never dress down. Visit MensUSA to discover a wide range of peak lapel suits of different colors and designs and purchase the well-fitted ones that will enhance your total appearance all the more.